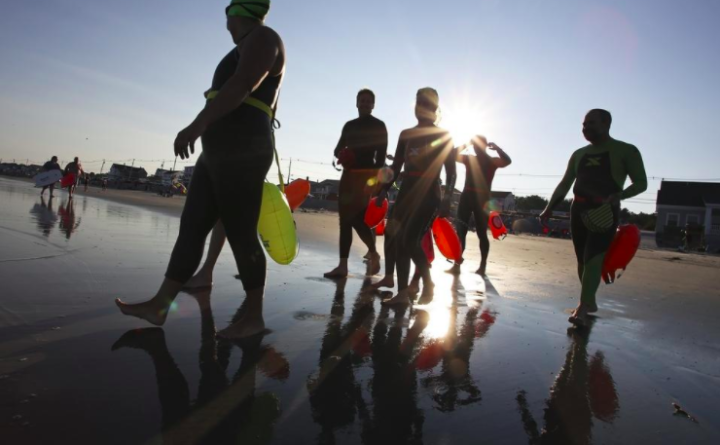 Swimmers head to the water at Long Sands Beach in York in preparation for the Nubble Light Challenge, a 2.4-mile swim that raises funds for the Maine branch of the National Alliance for Mental Illness. The swim will take place on Saturday. YORK, Maine — The key to the annual Nubble Light Challenge is to be ready for whatever the Atlantic Ocean has in store for you on the day of the race. Just ask John Gale. The swimmer has taken part in the annual fundraiser for the National Alliance on Mental Illness, or NAMI, every year it has been held since 2010. This year, the Nubble Light Challenge will be held on Saturday, Aug. 25. The race takes participants from the waters of Long Sands Beach to Short Sands Beach, with a slip through the gut at Nubble Light along the way. “We’re all going in with the mindset that whatever the ocean throws us that day, we can plow through it,” Gale said during a recent interview. Sometimes the ocean can throw swimmers enough to truly put the “challenge” in Nubble Light Challenge. During the first year in which the 2.5-mile race was held, the water was 48 degrees – in other words, “c-c-cold,” as Bob Fernald, one of the event’s organizers, described it. According to Fernald, the race that morning will start at 8:30 a.m. Spectators who want to see swimmers pass through the gut at Nubble Light are encouraged to be at Sohier Park at about 9 a.m. That’s when the first contestants are expected to winnow through. Fernald is organizing the race alongside fellow directors Bob Reed and Jennifer Zorn. Fernald has been helping the participants train for the swim every Thursday evening since the Fourth of July, he said. In addition to organizing the race, Fernald is a board member of the Nubble Light Challenge organization, an ultra-marathon swimmer, and an open-water swim instructor. Swimmers from all over the country — from as far away as Seattle — are expecting to take part in the Maine Coast Triple-Crown Swim on Aug. 25. “It’s such a pretty course,” Gale said. If there’s a breeze that day, the swimmers will have more than that at their backs as they swim the course. They’ll have a good cause, too. Funds raised through the Nubble Light Challenge go toward the Maine chapter of NAMI. Incorporated in 1984, NAMI Maine is the state’s largest grassroots mental health organization, according to its executive director, Jenna Mehnert. The organization offers support, education and advocacy to individuals of all ages. “Our agency provides a rich array of education and supportive programming, governed by a peer-delivery model that empowers community members with the understanding, skills and ability to engage in care,” Mehnert said. NAMI Maine acknowledges the stigmas associated with mental illness and makes sure its programs are exclusively delivered by those who have experienced its challenges. The organization’s center provides peer-to-peer opportunities, all in one place, to “equip and empower people to connect, grow, learn, and support each other in moving towards what they want to experience in their lives,” according to Mehnert. The organization is based at 1 Bangor Street in Augusta and can be reached at 1-800-464-5767. For more information, visit online at www.namimmaine.org . This year’s Nubble Light Challenge is expected to bring as many as 125 swimmers, up from last year’s total of 75, according to Fernald. The race’s cause is as much a draw as its scenic route. Gale expressed similar emphasis on the race’s significance. Registration for the event is officially closed. For more information about the race, however, visit online at www.nubblelightchallenge.org . “It’s such a spectacular course that we all keep coming back, year after year,” he said.